A masterpiece that is as timely as it is well written and performed. If only it could be played on repeat in Washington until the existence of the working poor was recognized. A masterpiece, I agree – song of the year so far. Re your second point, I’m sure the “working poor” are hoping that the recognition involves more than lip service. I think this one really blows “Bleed Red” out of the water. Such an impressive performance. Wow. And he co-wrote this? I’ll admit, I was a little wary of Ronnie’s solo career prospects after “Bleed Red”. It was just a little too kumbaya, cliche, tugging-too-heard-on-the-heartstrings… didn’t do much for me at all. But this is a modern-day classic. It’s a very novel idea for a song – story told through a job interview – the lyric is full of wonderful, original lines, the performance and production are perfect. It’s also a beautiful example of how to portray emotional tone throughout a song; it begins with him recollecting his admirable services and qualities, but there’s a subtle shift from pride to desperation as it goes on, culminating in the “wolves at the door” line in the third chorus. The narrator seems confident and sure of himself, but lost in terms of his place in a changing world and where his future in it lies. I think that’s a very timely sentiment to express – it’s what a lot of people are thinking but not saying right now. It’s a lengthy, quiet song that isn’t all sunshine and bubble gum, so it may not appeal to the soccer-mom, morning-drive crowd. But man, this better catch on with radio. #31 on Mediabase and Billboard right now and climbing. 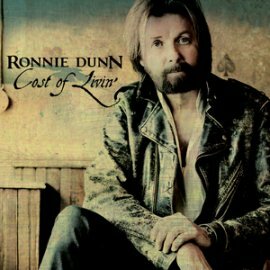 I’m loving this new, substantial Ronnie Dunn. He’s not wasting any time, huh? The arrangement, the vocal delivery, all very spare and understated, absolutely demanded my attention as the song began. The lyrics — I just about stopped breathing so I could listen to those words. Where “Bleed Red” sounds anthemic, this song embodies quiet desperation. I’ve missed Ronnie Dunn’s soaring vocals, but man, the simplicity here, including his masterful performance, makes it all the more powerful. I can hear a life story not only in the words, but in that voice. I’m blown away. Five stars to a great artist. I’m blown away by this one. Definitely a five-star effort, and frontrunner for song of the year thus far. The fact that a song like this even needs to be written tells me there’s a lot wrong with our fair country these days. But that said, this IS a fantastic song and Ronnie sings the hell out of it! I didn’t really feel “Bleed Red” much, but I like this one. Incredibly powerful lyrics. I’ve listened two dozen times, and am still in awe of the combination of self-pride and desperation in the testimony, seeking to provide human dignity of service in an increasingly mechanical demand for robots. Americans want to earn American wages, but pay Chinese wages. Americans are their own worst enemies. They refuse to pay other Americans to work.